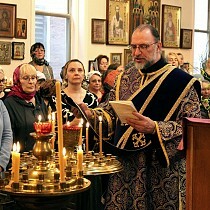 On Sunday, March 17, the feast of the Triumph of Orthodoxy, local parishes of the Greater Boston area, served Vespers with the Rite of Orthodoxy in Holy Epiphany Church in Roslindale, MA. 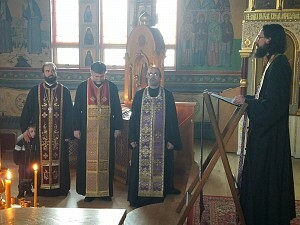 Services were led by parish rector Archpriest Victor Boldewskul, co-served by Archpriest Vasily Lickwar (rector of Dormition of the Virgin Mary OCA Church in Cumberland, RI), Archpriest Aleksandar Vlajkovic (rector of St. Sava Serbian Cathedral in Cambridge, MA), Priest Kevin Kalish (parish cleric), Priest Teodor Anastasoaie, cleric of Holy Resurrection Bulgarian Church in Allston, MA), Protodeacon Victor Ganson (parish cleric), and Deacon Andrey Sukharev (cleric of Holy Resurrection Church). Also praying in the church was Archpriest George Lagodich (cleric of St. Nicholas Cathedral in Montreal, Canada). "The Seventh Ecumenical Council in 787 A.D. restored and reaffirmed the proper veneration of icons. 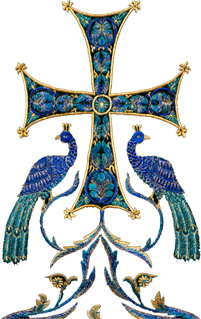 Yet it took time, nearly another century, before they were definitively restored in 843 A.D. by the Empress Theodora. 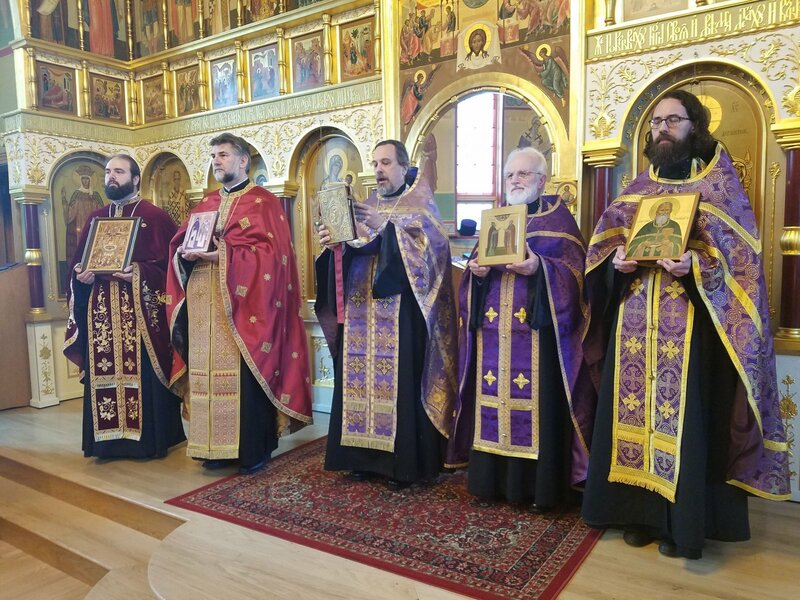 Subsequently, the first Sunday of Great Lent was dedicated to celebrating this restoration of the holy icons. "This Sunday, while it celebrates an event in history, is also about more than simply the use icons as beautiful objects to adorn our Churches. This Ecumenical Council, in defending the right use of icons, was also defending a right understanding of who Christ is. We celebrate the triumph of right belief, which was revealed to us by Christ in His coming to dwell among us in His Nativity; we celebrate the icons, because they attest to the saving action of Christ taking on flesh. The Church hands down to us this right teaching, preserved and maintained by the Holy Councils. And we celebrate this with joy because, in holding to a right view of who Christ is, we partake more fully in the life in Christ; we celebrate with joy, because through Christ becoming man, suffering on the Cross, being buried and rising on the Third Day, the doors of Paradise are again opened to us." The parish sisterhood prepared a lenten luncheon, where interaction between the faithful from the neighboring parishes continued throughout the evening.